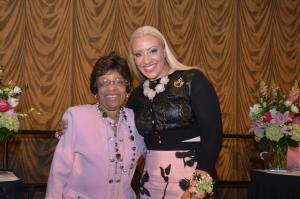 Mia K. Wright, pictured with Faye B. Bryant, the 21st International President of Alpha Kappa Alpha Sorority, Incorporated at the 2017 Houston Metropolitan Area Chapters of AKA Founders Day Brunch, where Wright was the keynote speaker. Mia K. Wright is the author of a new book titled, "Unthinkable"
HOUSTON, TEXAS, UNITED STATES, July 3, 2018 /EINPresswire.com/ -- Houston’s own, Mia K. Wright, co-pastor and director of ministry at The Fountain of Praise, a 20,000-member megachurch, has been selected to serve as a keynote speaker at Alpha Kappa Alpha Sorority’s 68th International Conference, which will kick-off in Houston this week. Wright will speak at the Ecumenical Worship Service on Sunday, July 8, 2018 from 1 p.m. – 2:30 p.m. at the George R. Brown Convention Center. Kurt Carr and The Kurt Carr Singers will be guest musical artists. The Ecumenical/Worship Service is open to the public, so attendees don’t have to be registered for the conference to attend. In addition to being a one of the most prolific voices amoung Houston’s ministry leaders, Mia K. Wright is also the host of the popular Metamorphosis women’s conference, author of a new book, “Unthinkable: Do the Unordinary to Experience the Extraordinary” and a long-time member of Alpha Kappa Alpha Sorority, Incorporated and The Links, Incorporated. 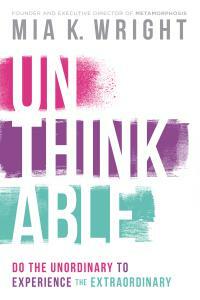 In her book, Unthinkable, Wright challenges readers to raise their level of expectation and break out of the restrictive boxes that many have placed themselves in, a message she will take forward to the thousands in attendance when she speaks at the Ecumenical Worship Service. Wright is a noted community influencer. She has been a host on TBN’s Praise the Lord and a guest on numerous television programs, including Daystar’s Joni Table Talk and Celebration programs, The Word Network, Life Today, Great Day Houston and KPRC News. Wright holds a bachelor of arts from the University of Texas at Austin and a master of divinity from Southwestern Baptist Theological Seminary. The 68th Annual International Conference of Alpha Kappa Alpha Sorority, Incorporated will be held in Houston, July 6-12, 2018. Events will be held all over the city, with the main sessions and galas at the George R. Brown Convention Center. Houston was selected as the host site for the conference because of its historical significance to the Sorority. The city is home to two former International Presidents, Mattelia B. Grays and Faye B. Bryant. Grays, the sorority’s 18th president, served from 1970-1974 and was the youngest person ever elected National President. Bryant, the sorority’s 21st president, served from 1982 to 1986. The sorority anticipates this will be its largest attended conference in its 110-year history, with attendees expected to travel from as far away as Germany, Japan, South Korea, Liberia, South Africa and Dubai. About Alpha Kappa Alpha Sorority, Inc.
Alpha Kappa Alpha Sorority, Incorporated (AKA) is an international service organization that was founded on the campus of Howard University in Washington, D.C. in 1908. It is the oldest Greek letter organization established by African-American college-educated women. Alpha Kappa Alpha is comprised of nearly 300,000 members in 1,012 graduate and undergraduate chapters in the United States, Liberia, the Bahamas, the U.S. Virgin Islands, Germany, South Korea, Bermuda, Japan, Canada, South Africa and the Middle East. For more information on Alpha Kappa Alpha Sorority and its programs, visit AKA1908.com.